Ayisha is the daughter of a rickshaw-puller from Bellary district in Karnataka. She is the youngest among 6 siblings. Ayisha was always good in studies and had a dream of joining the BPO sector after she learned about the global reach this sector had. Unfortunately, though her father encouraged Ayisha to study, he hardly had the means or resources to give her better education and fulfill her dream with the little he earned every day. His deteriorating health also did not allow him to work too hard. One day, The/Nudge Gurukul’s community mobilisation team interacted with the community in Bellary. Ayisha’s elder sister Parveen heard about the different livelihood courses Gurukul offered and immediately informed Ayisha. Parveen had seen the earnestness with which Ayisha approached her studies and knew that given a chance, her younger sister could do much better in life. It was only their impoverished state that was holding her down. Parveen convinced her father and brothers to send Ayisha to Bangalore for the 90 days residential training program that Gurukul offered. She believed Ayisha would use this opportunity to finally fulfil her dream of a BPO sector career. City life and Gurukul life were very different from the life that Ayisha had led so far. It was difficult for her to adjust initially, but her sister kept encouraging her. 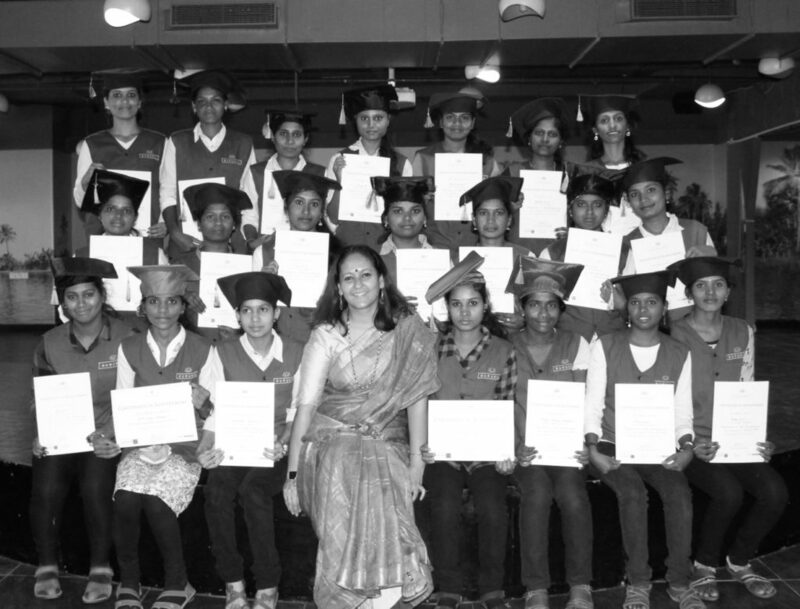 The Gurukul trainers, warden and her batch mates helped Ayisha adjust to her new surroundings. She realised the value of leading a routine, planned life in Gurukul where each activity including the morning yoga, the classes and the meal times too were planned. She made friends and found everyday a new topic to learn. Her English speaking skills improved, as also her numeracy skills. More than anything else, she was now learning the skills needed to fulfill her dream of becoming a BPO sector professional. 90 days rapidly transformed Ayisha from a quaint small town girl to a confident individual ready to change her destiny. Ayisha’s hardwork and sincerity wasn’t hidden and led her to be one among the best in her batch, earning enough Karma points to be in the Dean’s list of students. It was the day of graduation. Ayisha was looking forward to meet her family after 3 months and show them all that she had achieved. It was an extremely proud moment for her sister, brothers and father when they saw Ayisha walk up to the stage to receive her graduation certificate. She also spoke confidently about financial security that each youngster must consider and plan ahead accordingly. She shared her knowledge about various government schemes she had learnt at the Wells Fargo Gurukul that allowed individual’s to save for their better future. 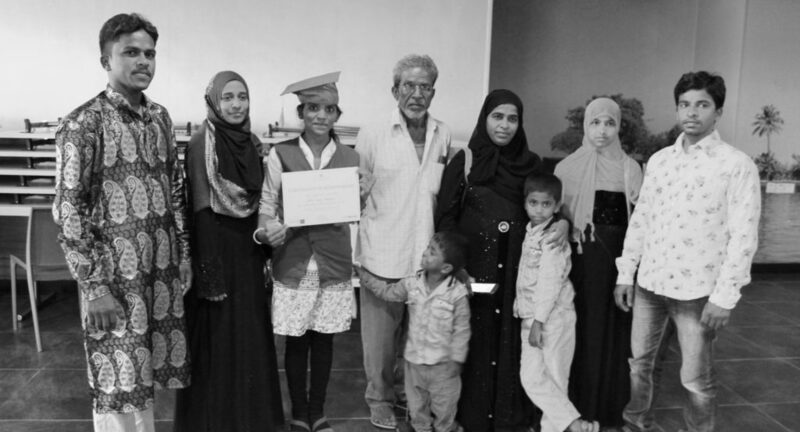 Ayisha’s family had come all the way from Bellary to rejoice in her achievements. Her aging father who has now retired didn’t speak much, but the pride he felt was evident in the way he kept smiling. Ayisha’s story can be the story of many such young girls and boys who never get the chance to achieve their dreams because of poverty. If you would like to support The/Nudge’s Gurukul in our mission to alleviate poverty sustainably and scalably, do reach out to us here. Thank you Wells Fargo for helping fulfill Ayisha’s wish. Ayisha is now working at HGS earning a starting salary of Rs. 10, 000/- per month. This is her very first job. Here’s wishing her a bright future ahead!  Archived in Student Success Stories and tagged BPO, BPO career, BPO job, Gurukul, job, Poverty, Poverty Alleviation, skilling, The/Nudge, Wells Fargo, youth. Bookmark the permalink.